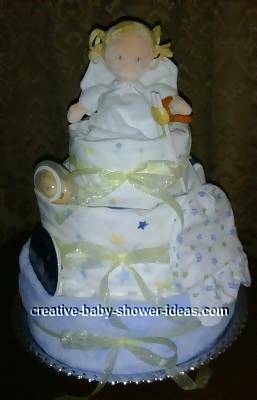 You can create a beautiful disposable diaper cake! Our instructions and ideas will show you how. This category has angel themed cakes in it. View the other categories in the index below. I made this diaper cake for my sister and her husband for their first baby. 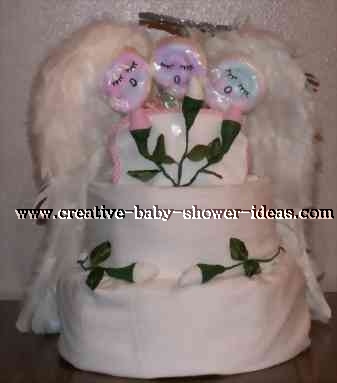 They are singers and the baby is going to be a girl so I came up with the idea of having singing angels for their diaper cake. It is 3 layers tall. I used baby sock roses as microphones and washcloth lollipops for the heads of the angels. Since Halloween is coming up, I also made angel wings and a halo with arm straps for the baby's Halloween pictures. 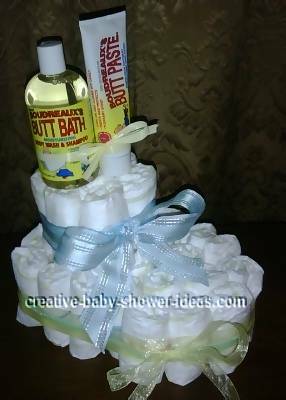 I used the instructions on this website for the rolled diaper cake design and baby sock roses.